The Switronix TorchLED Bolt On-Camera LED Light is a 200W-equivalent light for attaching to the top of your camera – or (likely via an adapter) to a light stand for use as a "sun gun" on a set or on location. 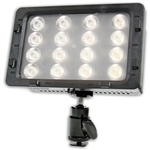 The 16-LED light is powerful enough to use as a fill light outdoors. The TorchLED features a brightness and throw (40-50') that put it in the range of halogen lights. Rental includes a Switronix Bolt Battery Kit consists of a 7.2v lithium-ion battery and a travel charger. Designed specifically for the TL-BT200 LED light, the battery has a 6600mAh capacity and will power your light for up to 2 hours / (a bit less at max light output). The charger works with any outlet rated between 110-220 VAC. It features an LED indicator that lights red when charging and that changes to green when finished charging. The Sony HDR-PJ580V High Definition Handycam Camcorder with Projector lets you capture video at Full HD 1920 x 1080 60p/24p resolution and then play it back in 1080p, using the camera's built-in HD projector. The integrated projector gives you the means to instantly view your movies on up to a 100" diagonal screen without any cables or connections. Besides shooting and projecting video, this camcorder can take 20.4 megapixel still images as well. The HDR-PJ580V stores your footage on 32GB of embedded flash memory, which supports up to eleven hours of recording. Plus, you can expand the storage capacity by using up to a 64GB memory card. The Sony NP-FV70 Rechargeable Camcorder Battery Pack (2060mAh, 8.4V) is a high capacity InfoLITHIUM V Series battery. InfoLITHIUM means that the NP-FV70 will display remaining battery life so you're never surprised by a loss of power in the middle of a shoot. The battery also features 15% higher capacity over the NP-FH50, and gives you the option to charge faster using Sony's optional AC-VQV10 fast charger. The 47" Camera Slider from Glide Gear allows you to make smooth linear camera movements to your shots. Constructed from aircraft grade aluminum, and finished with Glide Gear's patented low-friction polymer, this lightweight slider features two removable, height-adjustable legs, and a carriage with a 1/4"-20 tie-down for attaching your camera. The slider will support loads up to 19 lb but works best with loads up to 6.5 lb. An included 1/4"-20 to 3/8"-16 adapter allows you to attach tripod heads to the carriage. For mounting the track on tripods, the slider has 1/4" and 3/8" threaded holes in the middle and at both ends of the track. A carrying case comes included. The DEV-1000 Camera Slider from Glide Gear allows you to slide your DSLR or video camera while shooting video. It is 23.6" in length, made from anodized aluminum, and has a weight capacity of 19.8 lb. Its self-lubricating rails and plastic bearings are designed to provide a quieter slider than those with metal bearings. A built-in bubble level allows you to straighten your slider to the horizon. The rubber tipped feet allow you to use the slider as a standalone unit and can be removed when mounting the slider on a tripod. You can adjust the tension of the slider or lock it in place by using the turning screw knob on the trolley. Two 1/4"-20 and two 3/8"-16 holes on the base allow you to mount the slider to most tripods. A reversible thread on the trolley will take most tripod heads, allowing you to easily mount your camera to the slider. The Lilliput 664 monitor is a 7 inch 16:9 LCD field monitor with HDMI, Composite video and collapsible sun hood. Optimised for DSLR cameras. Giving you 2 operating frequencies to select from, the WLX-PRO VHF Wireless Lavalier Microphone System from Azden consists of a WL/T-PRO bodypack transmitter, a camera-mountable WR-PRO wireless receiver, an EX-503 omnidirectional lavalier microphone, a camera shoe mount, a mono to stereo adapter cable, and hook and loop fastener tape. The system has a 250' range of operation, and allows you to send wireless audio directly to the microphone input of your DSLR or camcorder. Its 2 operating frequencies provide an option in case one channel is experiencing interference. Blue Microphones Yeti USB Microphone Tascam DR-70D 4-Channel Audio Recorder Shure VP83F LensHopper™ Condenser Mic w/Fash Rec.